Frozen and chilled storage. We offer tailored complete warehousing and logistics solutions. This means we offer efficient management and reliable deliveries that give you full visibility of your inventory flow. Always at the right temperature. Got special requirements that need us to go the extra mile? We give priority to close and cost-effective partnerships with our customers. Our range of ancillary services offer a wealth of possibilities. Our new owners have invested heavily in the businesses by way of modernising our premises with new offices, staff areas, and extra loading ramps. Göteborgs Fryshus is now ready to take the next step and be an even better partner. 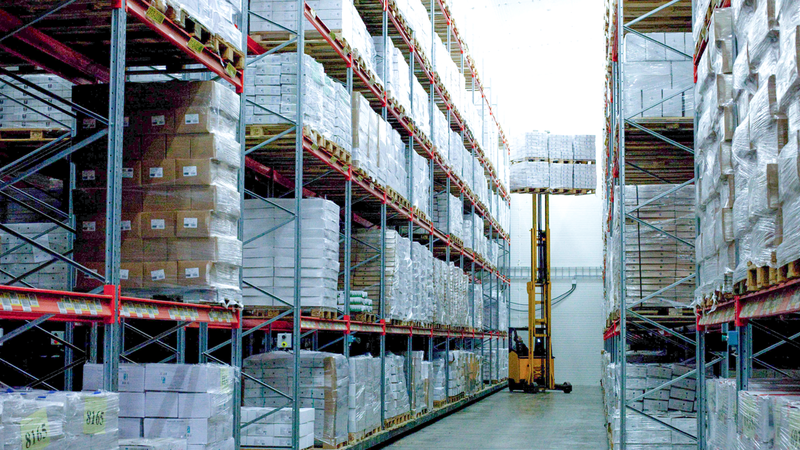 We’re a leader in frozen and chilled storage in Western Sweden. Our strategically located facilities (Slakthus District and Storås) near ports and main roads offer more than 16,000 pallet spaces. Distribution is a key element of our business. As thermo transport experts, we have extensive experience of maintaining unbroken chains for frozen goods. Want to switch to Göteborgs Fryshus? Relax, we’ll take care of everything. Need help unloading a container? At our facilities we can unload and distribute your goods onto pallets by hand for further processing. Customs warehouses – a cost-effective option. 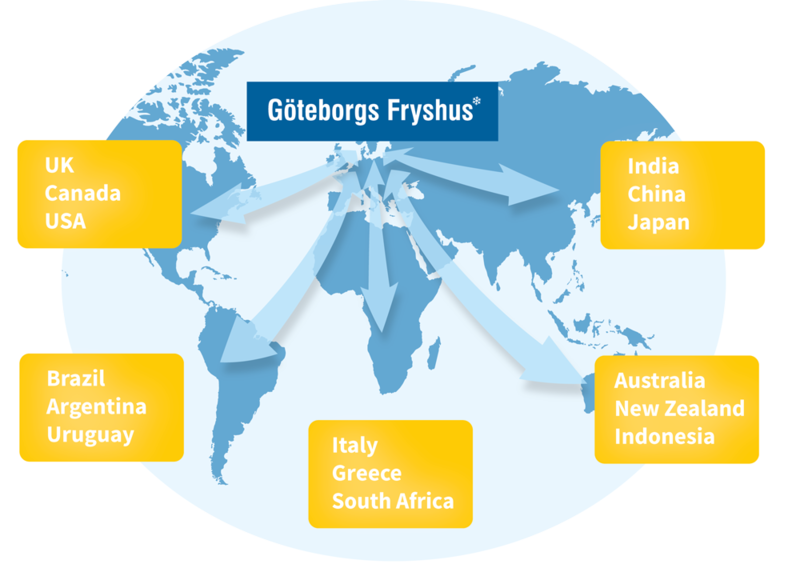 Have Göteborgs Fryshus provide customs warehousing for your goods and avoid having to worry about duties and other fees. We also offer dry storage, which means we can take care of all your warehousing needs. We have the capacity to address all your logistics needs, including labelling, repalleting, order picking, freezing, etc. Our goal is to co-ordinate and optimise your entire goods flow. Göteborgs Fryshus offers a complete frozen goods chain with frozen and chilled storage. Our goal is to co-ordinate and optimise your entire frozen goods chain from booking and thermo-transport to processing and final delivery. Our own fleet of trucks ensures that you receive your frozen goods on time and at the right temperature. We have a well-developed transport network that picks up and delivers goods around the world every single day. Having happy customers means everything to us. Quality and sound economics create opportunities – Göteborg Fryshus is IP food certified, operates according to the HACCP method, and holds an AAA credit rating. • A strong and personally committed team that works closely with customers and focuses on effective communication. • You get your own contact person who is responsible for the entire process from goods reception to delivery. • Warehousing and ancillary services that are tailored to ensure the most cost-effective and service-oriented solutions for end-clients. • Full visibility of your inventory flow via our online WMS system that sends automatic notifications for all inward and outward deliveries. • Capacity to grow to accommodate future needs with regard to range, flexibility, and service level. • Proximity to customers and suppliers by way of our own strategically located frozen and chilled storage facilities in the Gothenburg region. • Continuous training of all staff with the aim of developing the industry. Over the years we have given priority to long-term partnerships, with the aim of having satisfied customers. Today, we can proudly boast a broad customer base that is developing alongside us. Our customer base has helped us to constantly expand our knowledge and interest in new solutions within warehousing and logistics, all with a view to fulfilling industry expectations. Satisfied customers mean everything to us. We tailor our warehousing and ancillary services to ensure the most cost-effective and service-oriented solutions for end-clients. By working together closely and having frequent reviews, we can ensure that agreed procedures work to their fullest potential. If you have an idea about how your goods flow could be improved, don’t hesitate to get in touch. We’re constantly striving to be a preferred partner. Contact us for more information and to book a meeting.